You won’t believe how easy this showstopper of a cake is to make. 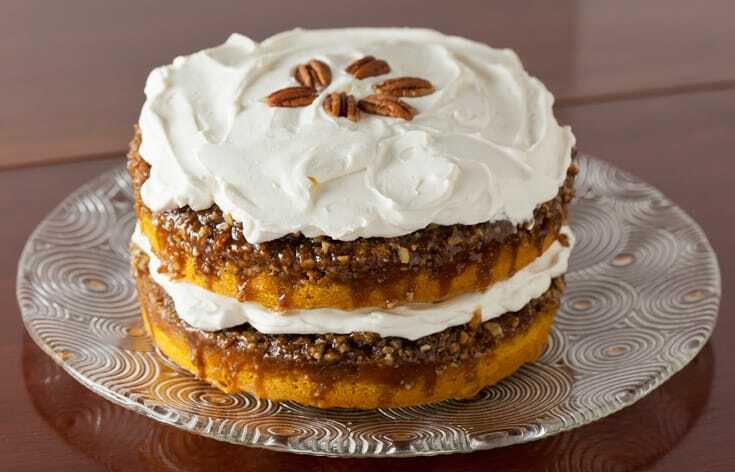 This Pumpkin Praline Cake with Whipped Cream Cheese Frosting would make a beautiful centerpiece on your Thanksgiving dessert table and your guests will look forward to it year after year. This post from the archives was originally published in November of 2010, but I’m bringing it forward with updated photos and a printable recipe to remind you of this amazing pumpkin dessert! I usually have a couple of boxes of yellow cake mix in my pantry in case I need to whip up one of Nana’s Lemon Jello Cakes – it’s always good to be prepared. But last night I was craving pumpkin cake. 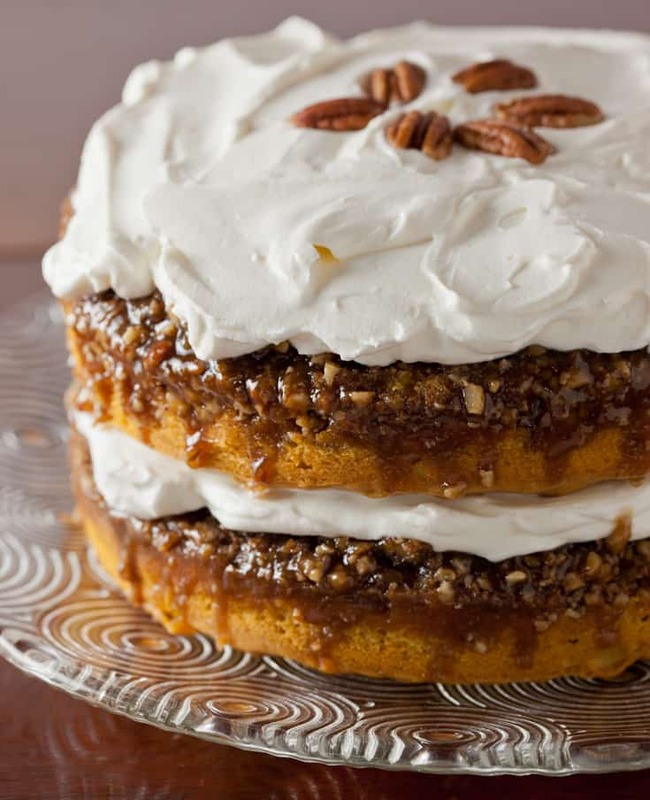 I had planned on throwing together a quick pumpkin spice cake from scratch until a Google search led me to this Praline-Pumpkin Cake from Betty Crocker. Other than Nana’s Lemon Cake, I don’t use cake mixes much. Making a cake from scratch usually isn’t difficult and I do prefer to know exactly what ingredients I’m adding to the mixing bowl. But this pumpkin praline cake was calling to me and I had all the ingredients on hand. Cake mixes definitely have their place and this cake was so delicious that I wouldn’t change a thing… except the frosting! The original recipe instructs you to use canned cream cheese frosting, but I couldn’t do that. In my opinion, canned frosting tastes terrible, especially the cream cheese variety. This amazing pumpkin praline cake deserves better. Instead, I made a lightly-sweetened whipped cream frosting using both cream cheese and whipping cream. It’s perfect on this cake – not too heavy, not too sweet. And it’s almost as easy as opening a tup of frosting from the store. Make sure the pumpkin praline cake layers have cooled completely before using the whipped cream frosting or it will melt and your layers will start sliding (trust me, it happened). You might even want to put them in the refrigerator for 30 minutes after they have cooled, before frosting the cake. After frosting, serve immediately or refrigerate the cake. This is one cake that actually tastes really great cold. In fact, I think I liked it even better after it sat in the refrigerator overnight, so it’s definitely one you could and maybe should make ahead. Although I always look forward to pies at Thanksgiving, this is one dessert that might give Thanksgiving pies a run for their money. It’s easy to make, looks impressive, and tastes amazing! The following recipe was adapted from Betty Crocker’s Praline-Pumpkin Cake. 1. Preheat oven to 325°F. In a small heavy saucepan, stir together butter, whipping cream and brown sugar. Cook over low heat, stirring occasionally, just until butter is melted. Divide topping between two ungreased 8- or 9-inch round cake pans then sprinkle evenly with the chopped pecans. 2. In a large bowl, beat cake mix, pumpkin, water, oil, eggs and pumpkin pie spice with electric mixer on low speed until moistened, then on medium speed for 2 more minutes, scraping bowl occasionally. Carefully spoon batter over pecan mixture in each pan, dividing as evenly as possible. 3. Bake cakes for 41 to 47 minutes or until cake springs back when touched lightly in center. Cool 5 minutes then turn cakes out onto a cooling rack. Cool completely before frosting (at least an hour). Using an electric mixer (I used the whisk attachment on my stand mixer), beat the cream cheese, vanilla, and sugar until light and creamy. Beat in 1/4 cup whipping cream until smooth (scrape and stir with spatula as necessary). Add the rest of the cream and beat until it has the consistency of whipped cream (don't overmix). Place one cake layer on decorative plate or cake stand, praline-side up. Spread half of the frosting on top of cake. Top with the other cake layer, praline-side up. Spread the rest of the frosting over the top. Decorate with pecan halves. Serve immediately or store in the refrigerator until ready to serve. If cake is made ahead, take cake out of the refrigerator about an hour before serving. It does not need to come completely to room temperature before serving as it does taste good cold. Leftovers should be stored loosely covered in the refrigerator. Wow! Your pictures are beautiful. I want some of this! No, I NEED some of that... like, now... like, RIGHT now! i can't take my eyes off that beautiful cake. wow. ooh, that looks and sounds so good! That whipped cream frosting sounds like the perfect light touch on so much good flavor! this looks absolutely must-have! I don't have (& never use) any cake mix - can you recommend a-made-from-scratch-cake recipe to replace the boxed stuff? PS yours looks much niver than the cake on the Betty Crocker site! yeah perfect nice dessert cake. I like the outlook of your cake. I need some of that for the debut of my daughter. This one is perfect for the theme of her debut " purity of a lady". Thanks for sharing your recipe. Thank you, thank you, thank you for sharing this WONDERFUL recipe with us. It was the NUMBER ONE HIT at the family gathering, 40 people, 14 pies and this spectaclar cake. One woman in her late 60's said it was the best cake she has ever eaten. I need to say BRAVO also for you recipe for the frosting .... it is absolutely to die for and the addition of the cream cheese to the whipped cream really stabalized it and helped it keep its peaks. Your right about it tasting better after refrigeration .... there was just about a slice worth left when I repossed the plate and it was AWESOME the next day! The praline is such a good complement to the pumpkin cake. Make this the next time you want someone to rave about your cooking skills! Wow that cake looks gorgeous. I'm a strict scratch baker, but this looks so good, I'll probably try and come up with a scratch version! Easy and delicious. This is so perfect for me since I am not really a good baker. LOL. This will be the dessert for my daughters debut party. I'm in the middle of making this cake right now - my layers are on a cooling rack and they smell SO GOOD. One word of advice though - use the 9 inch pans. I used 8 inch pans since I don't have two 9 inchers, and my layers came out a little wonky-shaped... I might frost them individually and just have two cakes instead of one, since I'm not sure how they'll stack. But I'm sure it'll taste great either way! Did you use a cream whipper? I bought one recently with a load of syrups, one of then being pumpkin. 5* for the cake by the way it looks delicious! Thank you for introducing me to the amazingness that is brown sugar, butter and whipped cream! Those three ingredients alone made this cake perfect! I was a little bit skeptical of using the cake mix, but it turned out great! I have a little work to do in my icing abilities-my cakes never look like the pictures do! But that being said, I got loads of compliments on this cake. Great for events! I love this icing recipe! I will never make a regular cream cheese icing again! This is so light and fluffy. Thanks for sharing. YUM, I've been dying to try this and you make it look so good, I think I will. I would never used the canned whipped stuff either, I will try out your recipe instead. Question--I think all I have at home is half and half...do you think this will work in place of the whipping cream? well, that looks good enough to eat! actually the idea of a pumping cake is very appealing - and something I've never tried. I'll definitely have to give this one a go - I actually have a shed full of pumpkins all ready to go. I think I should try back here after I've made it so I can report on my efforts. I was searching through pinterest for cake recipes for my friends birthday. When I narrowed down the results for the flavor she was looking for, she chose this one. I work at a bakery/restaurant that makes "Sticky buns" with a similar topping, so this sounded like a pumpkiny goodness cake version of those! I added just a tiny spoonful of some of the pure pumpkin to my whipped frosting and it turned out wonderful. I will be sticking with this recipe as my whipped cream cheese frosting. You can add great flavors for a twist or make it exactly as directed and you'll be satisfied no matter what. Great recipe! I made this cake out of last year's (2011) fall Betty Crocker cook book that I found at the checkout of a grocery store.... I didn't layer it, just used one full cake pan, and then made my own cream cheese frosting, similar to yours but I added cinnamon and pumpkin pie spice to it to add a little more kick, and it was wonderful! I actually won my company's holiday bake-off with this cake! So I made it again for my family for Thanksgiving and they all loved it too... Definitely an excellent recipe!!! can you please clarify. I am about to make the whipped cream frosting. Is the whipping cream that I add (first 1/4 cup and then the rest) whipped or just heavy cream? I made this cake, but accidentally overlooked the cream cheese in the frosting. I substituted my blend of Gluten free flour, and It was fabulous! Served it at a dinner party, they loved it. I made it a second time yesterday, but made it as a sheet cake and topped with the whip cream instead o f frosting. I noticed that the Whipped cream made the Praline topping soft the first time. The second time using the whipped cream as a topping was much better. The Praline was still crunchy and the sweet whipped cream was the perfect compliment. This one is going on my favorite cake list!